Comment: The opening of Genesis describes how all things began: everything was formless and void, but God was there. God is our beginning. Whatever comes after, heavens and earth, light and darkness, days and nights, all of it is rooted in God. 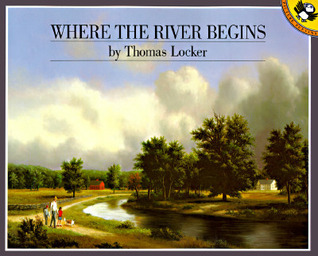 In Where the River Begins, a boy and his grandfather are interested in the river that runs near their home. They decide to embark on a trip to find out where the river begins. They are searching for its origins, and in the meantime, they enjoy the beauty of the river and one another’s company. When we search for our origins as people of faith, we enjoy the story of Scripture and of saints who came before us, and God is through it all, speaking and creating. And when we find the beginning, we find that in the beginning was God. Comment: In The Story of Fish and Snail, the two animals live inside their book, and are happy there. Fish, however, also spends time in other books, having adventures, and when he returns he tells Snail about them. But Snail is too afraid to go outside his own book, and is content simply to hear about Fish’s adventures—that is, until Fish has an adventure that is too grand simply to tell, Snail needs to see it for himself! Snail refuses to go with Fish, too scared to venture outside his own book, and Fish leaves upset. But Snail decides his friendship is too important to give up, faces his fears, and ventures out to find Fish. Their friendship is restored, and Snail has plunged into his first adventure! When Paul is in Ephesus, the people there are baptized, but not into the Holy Spirit. They have never even heard there is a Holy Spirit. There is more to baptism, if they are willing to take the plunge, and go deeper into their faith. They are willing, and when Paul baptizes them in the Spirit, the Spirit works in their lives, bringing new gifts. What is unfamiliar can seem daunting, but when we step out in faith, like Snail, and like the people of Ephesus, our lives are changed for the better. Comment: John’s baptism is for the repentance of sins. Repentance is already a profound change, a complete turning around from who we used to be, making us new people. And John goes on to proclaim that the baptism of the one who comes after him will effect even greater change—a baptism with the Holy Spirit, who sanctifies and makes us holy. Baptism brings forth new creation, a change toward repentance and holiness. In Pigeon Needs a Bath, Pigeon is very dirty, but absolutely refuses to take a bath. He is confident that he doesn’t need one. But eventually the bus driver convinces him, and after initial hesitation, the Pigeon plunges into his bath—and loves it! He, in fact, loves it so much, that he might never get out of the bath. He loves this new experience, and how it has changed him. And so, too, with the baptism John proclaims, and with our baptism: it is an experience that deeply changes us into repentant and more holy people. This week’s Lectionary Links are written by Union Presbyterian Seminary alumna Sara Anne Berger. Lectionary Links: Sunday, January 11, 2015 by Storypath is licensed under a Creative Commons Attribution-NonCommercial 4.0 International License.